Can horses help your management team or staff? Absolutely! vR Equine Assisted Corporate Training is an innovative and experiential program offered to corporations and other businesses that wish to improve various skills in their teams. Our program uses team-building exercises with our horses and facilitators to develop leadership, communication, personal growth, corporate culture, and positive team development. We will tackle real world challenges occurring in your business, or simply focus on giving you and your team a fun and different training experience, all based on the needs of the team. 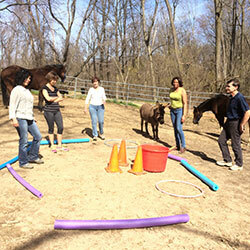 This type of Equine Assisted training is not riding, but involves setting up ground activities involving the horses, which in turn requires the team to apply certain skills. Why Use Horses in Human Growth and Learning? There are numerous reasons to use horses in human training programs. 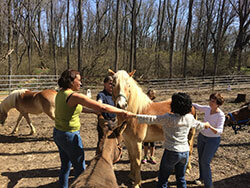 Equine Assisted Growth and Learning provides the one thing all other experiential programs cannot. The opportunity of using a, living, breathing, rather large, reacting creature creates an environment of constantly changing and evolving experiences. Horses are responsive beings. They have an awareness of, and sensitivity to, their surroundings. Horses have as many individual personalities, physical abilities and limitations as the humans they are working with. Most of all, horses give immediate and honest feedback which can show us what we need to change in order to achieve a partnership for goal accomplishment. Let’s look at it from a corporate learning environment. How often have you attended training sessions with your manager or supervisor and didn’t really feel comfortable fully participating in the program? Horses don’t care about a person’s position, power, status or title. They are acutely perceptive, totally honest and have no hidden agendas. With horses on your team, you can feel totally free to participate to the fullest. 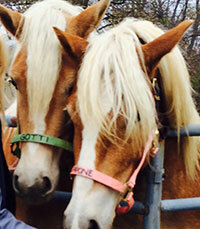 Your EQUINE teammates can very accurately sense your level of trust, confidence, awareness, and interpersonal skills. Horses offer us opportunities to learn what we need to change, in order to succeed in personal and professional relationships. or business team building event? Participants will be asked to participate in activities with the horses on the ground. No previous experience with horses is required. Activities will be set up by the facilitating team that are designed to elicit natural responses and patterns of behavior. The facilitating team will be asking questions of the participants while observing them in action. Because horses will “mirror” the behaviors of those around them, the participants will be given immediate, honest feedback. *Find and develop the hidden strengths within yourself and your organization. * Develop resiliency in the face of change. *Increase both staff productivity and investment. *Taking people out of their normal environment allows for new ideas and perspectives to arise. vR Equine Assisted Growth and Learning Center uses the EAGALA model. 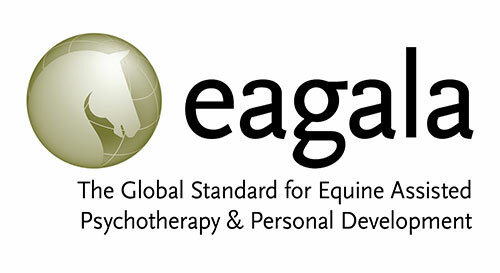 Founded in 1999, the Equine Assisted Growth and Learning Association (EAGALA) is the leading international nonprofit association for professionals using equine therapy (horse therapy) to address mental health and human development needs. Our vision is that every person worldwide will have access to these services known as Equine Assisted Growth and Learning. What does a team building day look like? This 1-day team-building program is designed for corporations to grow, learn and have some fun. Horses are not only your facilitators but your teammates as well. Custom designed retreats to meet your company’s goals starting from $950.